Our 16 cottages, ranging from one-room buildings to five-bedroom cabins, line the western shore of Stand Cove on the eastern edge of Cape Rosier. 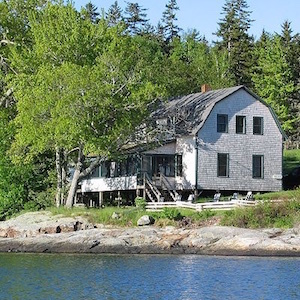 Most cottages are perched on the rocks right at the water’s edge; a few sit a dozen yards or so up the low hill that rises gently from the shore. Each is distinctive in its architecture and furnishings; all have excellent views of the Bay and the spectacularly varied morning light. The cottages are old, many dating from the 19th Century with the oldest pre-dating the Revolutionary War. While vintage, the cottages are comfortable: each has been recently remodeled, with screened-in porches, ample windows, well-equipped full kitchens, and bathrooms with showers. Bedrooms are furnished with twin and double beds. Twin beds can be converted to a comfortable king upon request. Inflatable mattresses can be supplied to accommodate additional guests. Our ongoing attention to the details ensures that each cottage is ready for you to enjoy. All of the cottages have electricity and hot water. Each has a wood stove for heating, and we supply kindling and firewood, replenished weekly. Summer Season rates include linens, as well as breakfast and dinner served daily. Spring and Fall Season rates include neither meals nor linens. *Moss Wood rates do not include meals. The weekly meal charge is $350 per person, per week for breakfast and dinner; kids 12 years and under are $250; 4 and under are free. There is an additional charge of $250 per person per week for parties over ten. Reservations are accepted on a first-come basis; we recommend that you make them well in advance. Click here to Contact Us. We require a 30% down payment for summer reservations and 50% for spring and fall. Deposits are not refundable after December 1st. If you cancel your reservation prior to December 1st, we will refund your deposit. No deposits will be refunded for cancellations after December 1st. Only Saturday to Saturday or Sunday to Sunday reservations will be accepted. Rates are not pro-rated for late arrival or early departure. Check-in time is after 4:00 PM. Check-out time is before 10:00 AM. We accept payment by cash or check only; no credit cards. Well-behaved pets are welcome when we’ve approved this during booking.